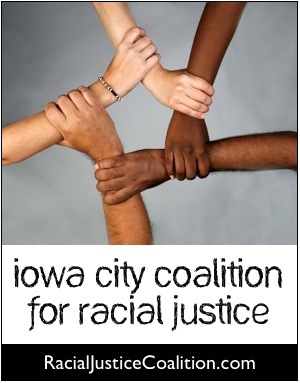 Please join us for the next meeting of the Coalition for Racial Justice. On the agenda: report from Black Voices Project on current initiatives and their role in the CRJ; report on the Black Town Hall meeting and discussion of how CRJ can best support their work; Martin Luther King Day and Black History month; consideration of how to work best with the Coalition for Affordable Housing and other groups we share interests with; immediate organizational needs of CRJ — steering committee/convener for next few months. Please join us for the next meeting of the Coalition for Racial Justice. All are welcome! Meeting: Thursday, July 10, Noon – 1:30, Center for Worker Justice, 940 S. Gilbert Ct.
Meeting: Thursday, May 8, Noon – 1:30, Center for Worker Justice, 940 S. Gilbert Ct.
Meeting: Thursday, April 10, Noon – 1:30, Center for Worker Justice, 940 S. Gilbert Ct.
Meeting: Thursday, February 13, Noon – 1:30, Center for Worker Justice, 940 S. Gilbert Ct.
Meeting: Thursday, January 9, Noon – 1:30, Center for Worker Justice, 940 S. Gilbert Ct. Please join us for the next meeting of the Coalition for Racial Justice. Your input is important and we look forward to seeing you there!